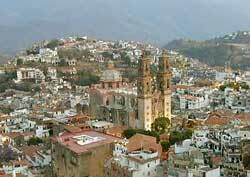 Taxco is a small, colonial hill town known internationally for its artistic silver products. Its charming narrow cobblestoned streets and alleys are lined with whitewashed buildings sporting red-tiled roofs and wrought-iron balconies cascading with flowers. The Spanish conquistador Cortes put Taxco on the map in the 1500s when he opened the town's first large-scaled silver mines. It is its Santa Prisca Parish (see photo), a superlative example of the Mexican Baroque architectural style. It was conceived and funded in the mid 1700s by Joseph de la Borda. After discovering a sizeable silver deposit, he became one of the world's richest men, but lost his fortune, partially due to his generous contributions to the Santa Prisca Parish. The silver mines became nearly exhausted. But in the 1930s, an American named William Spratling taught local residents the art of silversmithing to use what silver was available. He sold their work abroad. Soon the town once again became famous for its silver.